This might be the coolest thing I've seen recently when it comes to hair styling tools. The FHI Heat Runway IQ Session Styling Rapid Hair System takes a new approach to hot rollers. It has a heating base that is never hot too the touch, which allows you to avoid accidents and injuries. The rollers are heated one at a time instead of all at once and each roller only takes 8 seconds to heat up to 284 degrees! The rollers are made of ceramic which evenly heats the hair, locks in style, and the ceramic technology conditions the hair with less damage than other materials. The rollers only remain hot for a designated amount of time which encourages longevity of the style but avoids excessive heat on the hair. All you do is pop one into the heating base and in eight seconds the light goes off and the bell dings and the roller is ready! The roller gradually gets hotter, which gives you enough time to work with it before it gets too hot to touch. The cool thing about FHI Heat Runway IQ Session Styling Rapid Hair System is that the sides of the roller will turn clear when the roller is hot at 284 degrees and will return to dark grey when the roller is cool. 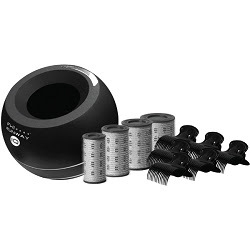 This system takes all the guesswork out of using hot rollers! With this system you can achieve tight ringlets, luscious curls, loose waves, or even seductively straight styles with tons of body.